Hummingbirds are on the move and your feeders are supporting Hummingbirds passing through! Keep feeders filled with fresh nectar. Keep Hummingbird feeders up for two weeks after your last sighting. This Will NOT keep your Hummers from migrating – promise! Any visitors now need to bulk up for an incredible migration! Goldfinches (and their newly-hatched broods) are active, too! Remember, juveniles are the squeaky ones learning to navigate your nyjer feeders and discovering the tastiness of hulled sunflower kernels.. They are feeding voraciously, so you will need to keep a closer eye on seed levels. Fall Migration is on! 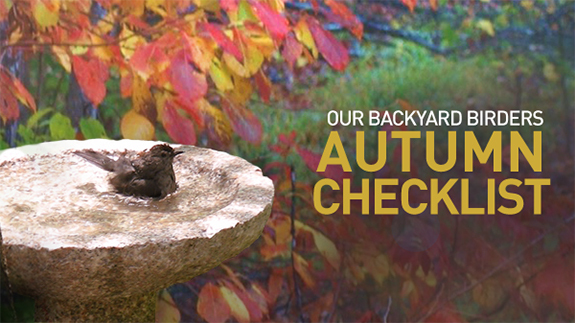 Keep your bird baths clean with fresh water to lure in beautiful Fall migrants as they head south. These are mostly non-seed eaters, but water is essential to all wild birds and will encourage them to hang out and rest a bit. Don’t deadhead the flowers in your garden! Goldfinches will do it for you and it is pure joy to watch them in action. Clean out your bird houses to get them ready for winter roosting during bad weather. 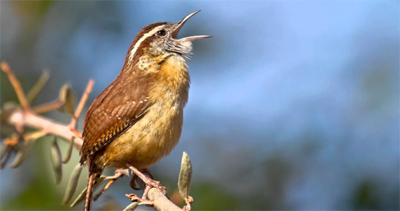 Chickadees, Carolina Wrens and Bluebirds will be particularly grateful! Check the freshness of your bird seed! if your seed is left over from last winter because you don’t feed during the summer, it’s time to buy fresh. Oils in seed go rancid over time and are unhealthy. Clean your bird feeders! Now’s the time to clean your feeders and remove any moldy remains from our hot and humid summer. The good news!! It won’t be long before Juncos and White-throated Sparrows make their appearance. Birding during Fall Migration is awesome! Keep your field guides and binoculars handy for unusual sightings, because you never know who’s going to show up!